Happy 100th Birthday, Tom Slick! May 6th is a special day for MSF and all the world! It marks the 100th birthday of our founder, Tom Slick, Jr.! We will mark this momentous day with a friendly competition on our Facebook page and at midnight CST pick 3 random correct answers for a special prize. Thomas Baker Slick, Jr. was an oilman, rancher, philanthropist, and even carved out a little time to found a number of institutes including the Southwest Research Institute, Texas Biomedical Research Institute, and the Mind Science Foundation that are still around today! He was born in Pennsylvania on May 6, 1916 to Thomas Baker and Berenice (Frates) Slick. His father was known as the "King of the Wildcatters" and left an inheritance from oil operations to his children. Tom, Jr., used this wealth to support a variety of interests including art, cattle breeding, exploration, scientific research and world peace! He earned a biology degree from Yale University and took graduate courses at Harvard and MIT and went on to serve in the military during WWII. 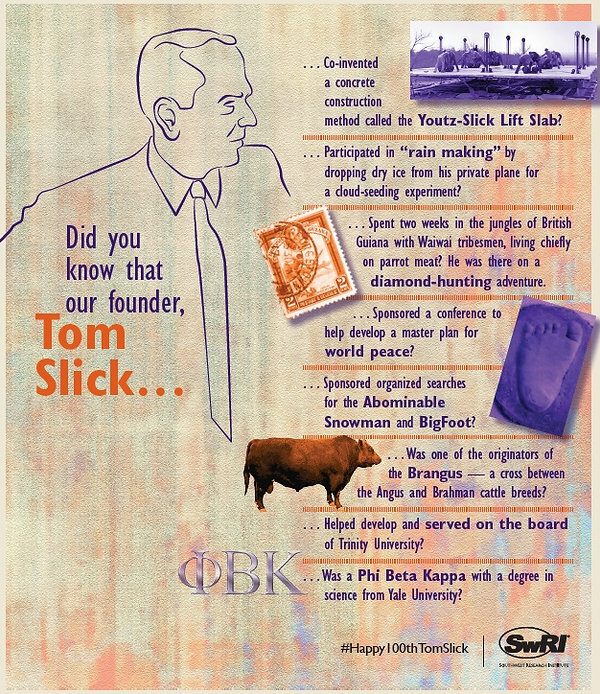 Tom Slick, Jr. was a inventor, writer, art collector, avid adventurer and world traveler, a modern Renaissance Man! He spent weeks in the jungles living with local tribes, hunting and learning ancient medicines, searching the Himalayan Mountains for the Yeti and roaming the Pacific Northwest for Bigfoot. When he was home with his family in San Antonio, he found time to serve on numerous local Boards and Associations and advise through his worldly lens. He tragically left this world too soon at the young age of 46 in a plane crash. His excitement and curiosity still live on though in the foundations and institutes he established. May we all be so lucky! On this momentous day, we celebrate 100 years of history and adventure and like to think he would be amazed at how far we have come learning about the human mind and how society has transformed into it's technology driven way. Here at the Mind Science Foundation, we would like to think he would be very proud of the newest adventure we are going to undertake. Next year we will be hosting a new conference: Emerging Technologies and the Future of Being Human with MSF favorites leading the discussions and a worldwide presence of scientists, entrepreneurs and leaders. Stay tuned for more information. Happy 100th Birthday, Tom!